A 21 year old man has been questioned by police after a complaint from a man in his 30s. The fire in Holly Road broke out in the early hours. A major incident has been declared in Weymouth after a fire involving gas cylinders broke out in a residential area. Around 100 homes were evacuated at 5 am this morning after fire broke out at a garage in Holly Road. Crews from Weymouth, Portland, Dorchester, Maiden Newton and specialist support vehicles (approx. 45 firefighters) have been dealing with the blaze, which is now under control. A rest centre has been set up for residents by local authorities. It is not known when they will be able to return to their homes. Dorset and Wiltshire Fire and Rescue Service said they did not yet know the cause of the blaze but would be investigating. Crews were called at 4.55am and after identifying the involvement of acetylene cylinders a 100m cordon was put in place. This meant the evacuation of surrounding streets and DWFRS would like to thank the Rock Hotel and local guest houses for their support with this. A rest centre is being set up by local authorities for residents. A major incident was declared. Firefighters have now got the fire under control using ground monitors and main lines, but will be remaining at the scene for the rest of the morning. 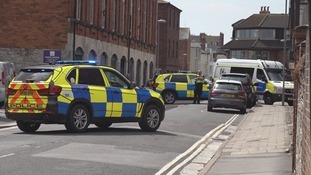 Three men have been arrested after a man was stabbed in the chest in Weymouth. A 14 year old boy who died after a crash involving a lorry in Weymouth in Dorset has been described by his family as 'irreplaceable'. The partner of a man crushed to death under his boat says he was a wonderful man. Kevin Keeler was carrying out repairs when it happened. A man has been jailed for a firearm offence in Dorset - after being spotted brandishing a gun in the street and threatening three teenage girls. 23-year-old, James William Rosser, was seen waving a gun around in the street at Magnolia Close, in Weymouth, at around 8.44pm on Saturday 11th February. During the incident, he confronted three teenage girls in an alleyway, pointing the weapon at them and asking if they'd seen any boys around and - as they hadn't - Rosser instructed the girls to tell the boys they were going to be shot. Police arrested Rosser at an address on the same street the following day. An air pistol and ammunition were seized. Rosser was jailed for sixteen months for possessing an air weapon with intent to cause fear of violence.